I thought that it started when our most recent tank recruit went missing. Voss pointed out that actually, it started when our DK tank stopped raiding about a year ago, and thereafter followed a cascade of turnover such as we’d never tackled before. Constant recruiting is wearing on a team, and the subsequent struggle as new players joined and the recruitment pool shallowed have made this a fairly hellish year for one small tens guild. Obviously, I can’t claim to speak for all guilds, and never have. I’m sure many guilds have had great years, and I’m happy for you. But not in this post, because this post is all about me, and my guild. Players dropped out one by one, with expressions of regret. They weren’t leaving for greener pastures, they were just leaving. “Tired of raiding,” “Not really feeling it,” “Would rather be doing something else.” I used to say to Voss jokingly, “We’ll stop recruiting if we lose x number of players at a time, or we’ll stop recruiting if we lose x percentage of our original team.” (I never followed through on that, by the way). Each time we lost someone, I’d hit the forums and WoW Lemmings. I’d refresh tirelessly throughout the day in-between work I was doing. I’d write personalized messages to convince people that BT was the guild they wanted to be in. For the most part, it worked. But it was like a full-time job. I spoke to potential applicants, fielded questions, did my best marketing pitch. I was always positive about the guild, and always happy to bring people to it, because I believed in the small community we’d made and wanted people to join it. Meantime, our progression started slipping. From a One-Light and a Tribute to Insanity to an H LK guild we slipped – to a 7/13 H guild, then a post-nerf 6/7 H guild, and finally, in this tier, a 0/8 H guild. Vosskah was right – the missing tank was only the last straw in an uphill battle I feel I’ve been waging all year, a struggle to stay above water. I’d committed to raiding Dragon Soul despite a deep tiredness that was underscored by the loss of my Grandfather at the end of November. It caused me to question many things personally – was I spending too much time on what is, ultimately, a video game? Did I want this to be such a major feature of my life? Could I reinvest my energy in another area? Who would I be if I wasn’t the guild leader of Business Time? How central was it to my identity? And more importantly, to me, how could I let everyone down like that? I didn’t have the heart to replace him. In a moment, just like that, I was done. I just couldn’t bring myself to do it, as if a lethargy had settled over me. I knew that if that’s how I felt, I had to come clean to the guild and tell them exactly how I felt. So I did, in an epic post that will remain for BT’s eyes only. I talked about our struggles, I talked about how damn proud I was of them, and more than anything I told them how sorry I was that I just didn’t have any more left to give. I didn’t know what the outcome was going to be, and I couldn’t even clearly articulate what had driven me to this point. I knew that by posting it, I was acknowledging the possibility that the guild would disband, or at least dissipate. It was a hard realization, but it was a choice between the dissolution of the guild and the continuing impact on my personal life and I think, my health. Please note (because guildies do read) that I have to write this for myself, to get it all off my chest and to sort through it, and none of it is meant as an accusation or a criticism of the folks in BT. Of course they aren’t perfect, and neither am I (duh) but really, there’s no hindsight ‘if only this’ or ‘if only that.’ Burnout happens. I think that ‘victims’ of burnout are probably often to blame because they failed to delegate properly, or even to give warning signs that they were feeling that way. That is absolutely my failing. I’m a firm believer that strong leadership doesn’t show weakness because as soon as you show signs of faltering, the entire team begins to doubt. In this case, I did us all a disservice because there was little warning. I posted that I needed some help, around the end of November, and then the beginning of January I was saying: I need to not be guild leader. I blithely pretended that our slow progression through heroics didn’t frustrate me. Of course it did, it frustrated all of us. What we were selling (a hard mode progression guild) wasn’t matching up with the reality: a guild that did hard modes but not all of them, and lately, a guild increasingly struggling with hard modes. Our new tank was very green and hadn’t done hard mode raiding at all. It was evident that he would have to learn, even before he disappeared. Underscoring all of it, I felt, was a sense of ennui. Forums that used to be hopping with activity in the strategy threads slowly dwindled to very little discussion. Mumble grew silent on progression nights. Voss admitted to me that he didn’t have the interest in hard modes that he’d once had, and I had to admit I felt the same. Was Business Time doing hard modes because we liked to do them, or were we trying to do them because they were what we’d always done? I asked myself this and many other questions. In the wake of my massive forum post, a few guildies spoke up. They wanted to have a meeting so that we could talk about what I’d said, and what the potential outcome might be. I prepared for the meeting with open eyes: There were three potential outcomes to this kind of guild shakeup. 1) Someone could step forward and assume leadership of the guild, with the realization that it would take a lot of time and work and recruiting. With Vosskah and I ceasing raiding, at the least, they’d need two new tanks and another DPS and a healer who’d also declared his intent to slow raiding. 2) I considered this a compromise between the two options; Business Time could decide to go casual, scale back our raiding operations significantly, and no longer attempt hard mode progression. 3) We could cease all raiding completely (effectively an end to the guild). So from there we had to figure out just what shape option two would take. Would we raid on the same day? For the time being we’ve agreed to make it a variable day based on availability each week, as well as tracking who has to sit (because we still have a roster of thirteen) so that nobody has to sit unfairly. This week we’re raiding Monday, and I’ll admit, it feels completely weird to be writing this on a Wednesday. Wednesday is Raid Day. All night I’ve been wandering around a bit lost, cooking supper at a leisurely pace, browsing the internet, chatting with Voss, and letting it sink in. For two years, we were raiding any two to three days of Monday, Wednesday, and Thursday. He’d come home, we’d cook supper hurriedly (or I’d have it ready beforehand) and we’d race to be online a half hour before raid time. Even on a night when we were on standby, we’d often check in to make sure we weren’t needed. We’d check the forums for any “I’m not going to be able to make it” messages. We’d prepare the raid roster, although in recent weeks that task has been assumed by another officer. We’d talk about the roster and any difficulties. Every day may as well have been an “officer meeting.” I don’t feel at liberty to go into Voss’ personal reasons, but we were both exhausted. What made it even harder though, was that we were tired of the raiding, not the people we were raiding with. I think many hobbies do have an expiry or a limited time on them. Gaming in general is a life-long hobby for me. Even WoW itself I have played for almost four years now. I couldn’t turn my back on the raiding without feeling that I was turning my back on ‘my guys.’ So to say I was absolutely astonished at the guild meeting is putting it mildly. I steeled myself to this decision. I wrote the post. I sat there crying for five minutes while my mouse button hovered over the “submit” button, feeling like I was pulling the trigger on something I loved, that had been a huge part of my life for two years. I was pretty shocked when I decided to turn away from my guild, and they wouldn’t let me. We went down the list of people, giving each a chance to talk about their feelings and goals. Many admitted that their life circumstances had changed since we first started raiding. Their enthusiasm for hard mode content had waned, their time available to play the game had been reduced, but they still loved playing with all of us. “I love you guys,” our rogue declared. “You’re going to make me CRY,” I admonished them all. (Cry AGAIN, that is). I don’t want to get into my feelings about hard modes in general, encounter design, or why I think Ulduar was still the best raid I’ve ever done. Perhaps that’s for another post, and anyway, that strays into “maligning the way other people play” territory. I still respect hard mode raiders, it just took a great loss and a potential second loss to make me realize that I’m no longer one of them. I don’t have the drive to succeed at that level of content that I once did, and you know what? For the time being, I’m okay with that. Ironically, considering my last post, we had just as much fun messing around in LFR last week when our tank didn’t show up. We like the time spent raiding together, and that’s not dependent on the content we’re doing. All of this to say: I’m still a guild leader. I’m now the guild leader of a one-night-a-week, social and casual raiding guild. It feels a bit odd, but I’m sure it will grow comfortable over time. I don’t know what the future will bring – there may come a time when commitments or other interests drag people away from the game altogether. But as I told Business Time at our guild meeting, even if they quit to play Diablo III: Battle.net allows us to play that together. Those who are playing SWTOR have made characters in our little sister guild. I have a lot of the guys on Steam. If I’m playing any multi-player game, I want to be doing it with them. If that’s what I take away from this game the day the servers go dark – friends that transcend any particular game, any specific pixels – that’s more fortune than any person could ask for. I’m humbled, I’m proud, and as of this week – I’m also casual. It feels good. First, a brief preamble. It’s been brought to my attention that there aren’t many heroic tens guides out there – or many guides assume that you are a twenty-fives guild (with a twenty-fives roster to draw from) for these heroics. There are, of course, many strategies and what you choose to do will be based on the classes you have available to you. I’ve never written an actual boss-strategy guide, so bear with me here. This strategy may not be the one that your guild uses, in which case, feel free to offer your suggestions below. Keep in mind, though, that I run a troll-free operation. If you aren’t respectful and constructive in your remarks, they’ll never see the light of day. If these prove useful to folks I might consider writing more; your feedback is welcome as to format and key information! Guides are so much more work than any other blog posts; this post alone has taken me many hours to write and research. Thanks to BT members that read and reviewed the strat for me; I wanted to make sure it contained key information for all roles. So, your guild has cleared all of the normal mode content in this tier! Or maybe you haven’t, but you’re working on Nefarian and you’ve killed Cho’gall and you think, hey, maybe we could do some of the easier heroics. Well, Halfus has a reputation for being “the easiest,” and once you get a handle on it, it’s definitely doable by most ambitious raid groups. It is intense, and requires coordination from everyone to understand what’s going on. Heroic Halfus varies from the normal mode encounter in that you don’t have specific “active” drakes week to week. They are all able to be active. Everything does more damage (duh, I know). After six minutes, Halfus will use Berserk and the fight is effectively over, this is the enrage. This guide assumes that you are familiar with the normal mode Halfus encounter and all of the abilities. The key to this encounter is the debuff Dragon’s Vengeance. After you kill one of the dragons, Halfus will take 100% more damage. This ability stacks up to five times. The fight will start out incredibly hectic and become much more manageable as each dragon dies. Less damage will be going out, and Halfus himself will take more. At the end, when Halfus has a full stack of this debuff it is generally easy to bring him down. These are Halfus’ key abilities. Where applicable, variations applied by releasing a drake are noted in blue. Frenzied Assault – Increases the caster’s attack speed by 120%. Nether Scion: Nether fog blinds Halfus, reducing his chance to hit, attack speed, and damage done by 25%. Malevolent Strikes – Halfus’ attacks wound the target, reducing the effectiveness of any healing on it by 8%. Stacks up to 12 times for a max reduction of 96% to healing. Slate Dragon: Once every 35 seconds or so, Halfus will occasionally become stunned for 12 sec. Shadow Nova – [0.25sec Cast] Dark magic is unleashed, causing 47500 to 52500 Shadow damage and knocking back all enemies within 50000 yds. Storm Rider: Slows the cast speed of Shadow Nova by 500% (to 1.50 seconds) and makes it possible to interrupt. When his health is below 50%, Halfus will be able to cast Furious Roar – [1.50sec Cast] Halfus roars periodically, inflicting 19000 to 21000 physical damage and knocking his enemies to the ground. Activating the Time Warden allows the raid to dodge fireballs, and activating the whelps decreases the amount of damage done by the fireballs. You’ll want someone in the raid providing Shadow and Fire resistance. Sub-50%, someone has to be able to break out of a stun in order to interrupt a Shadow Nova, as Halfus will cast Furious Roar. He roars one, two, three times and then immediately begins to cast Shadow Nova. A mage can do this if positioned far enough away from Halfus that a Blink will land you facing him. (You can practice this on normal, too). I count his roars aloud, and on the third roar (immediately after I’ve been stunned) blink and then counterspell. Our raid has two mages doing this so we’re double protected. A human can also do it using Every Man For Himself, but regardless of how your raid handles it, someone has to or you’ll be eating Novas in that phase. It is worth noting that our initial H Halfus kills were accomplished with a slightly different layout than this; we used one Atonement/smite specced priest in place of a DPS, bringing the number of healers to an effective 3.5 or so. This additional healing allowed us to survive longer and we were still within the enrage timer, but better gear has allowed us to do it with only three healers. Another factor to consider is what type of tanks you have. A paladin is able to cleanse stacks of Malevolent Strikes off him/herself. Our paladin healer can do the same for our warrior tank, but not for both a warrior and a bear. This ability is huge in this situation. I’m sure it’s possible to use another composition (I’ve heard of both three tanks and four healer compositions, although naturally you can’t have both three tanks and four healers). This is the strategy that worked for us, it is by no means the only option. Your tanks should be close together to facilitate AoE damage to drakes and whelps and for ease of taunting. The rest of the raid should be loosely spread out on the right side of the room. Not so far as to be out of range of healers, but for much of the fight you can’t dodge fireballs and so should arrange yourselves accordingly. If you stand on a buddy, you will get fire dropped on his head. The DPS on the far right is someone releasing Nether Scion and then joining the group. The melee DPS by star is someone releasing the whelps; he/she will then move in to begin DPSing skull. 1. Storm Rider – the off-tank releases Storm Rider at the beginning of the fight, and it is the priority kill target. All DPS focuses on him. 2. Nether Scion – Someone has to release Nether Scion at the same time; I usually do this and then blink towards the group (but not INTO it). Our hunter misdirects to the OT; but in the absence of a hunter we have also used healer aggro to draw the dragon across the room and have the OT quickly taunt it. 3. Whelps – Released simultaneously with Storm Rider and Nether Scion. A special note about whelps; their ability isn’t particularly noteworthy however it is worth your time to kill them, and many classes are capable of doing so while simultaneously killing their primary target. Hunters and rogues have excellent AoE for this purpose, and fire mages are absolutely ridiculous. If you can get a good Combustion rolling on Storm Rider and then use Impact to spread it to the whelps, you will be laughing. Heavy AoE can bring the whelps down almost exactly when Storm Rider goes down, and so you already have two stacks of the debuff on Halfus! 4. Time Warden – Released only after two drakes are down. 5. Slate Dragon – Ignore, do not release, although on our very first kill of this our OT ran over and released him and the subsequent stun on Halfus allowed us to get the kill. Use at your own risk, but 5 stacks of the debuffs are not necessary to complete this encounter. I’ll get into specifics for each role after this, but basically the fight goes like this: Chosen drakes/whelps are released. The tanks will do some swapping. Storm Rider dies. Nether Scion and the Whelps die (likely together). After two drakes are down, Time Warden can be released. Once Time Warden is down, DPS Halfus. Below 50%, he begins to roar – but so long as you make sure to interrupt his shadow novas (and even if you miss one, perhaps) you win! This is what "winning" looks like. I PROMISE. One tank will be tanking lots of things (many whelps, handle it). This tank handles Storm Rider, Nether Scion, and the whelps at the same time to start the fight. 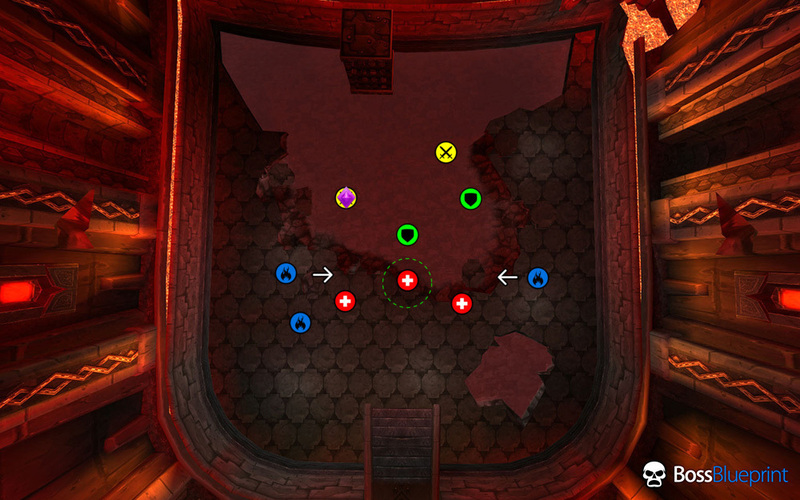 The challenge here is maintaining aggro on all of the targets and using your CDs simultaneously so that you don’t keel over. Any debuff you can put on the whelps and dragons to reduce their damage done will also be a boon (Demoralizing Shout, Thunderclap, etc.) All of the adds and Halfus should be tanked in the same area to allow for easy taunting. The other tank initially handles Halfus. Note if you are a warrior tank (and usually charge to begin the fight) do not charge towards Halfus. Pull him and make him come to you at first. The reason for this is because the Halfus tank will be gaining stacks of Malevolent Strikes quickly. If you acquire these before Halfus receives the debuffs from the released drakes/whelps, a dead tank could result! With MS stacking, this tank can’t take Halfus for too long before becoming unhealable. If your main tank is a paladin, then they can let their MS strikes accumulate to ten and then cleanse them by quickly using bubble and then canceling it. Here’s a macro to help you handle that, straight from Rhidach. You have to hit it twice. The tank will begin to gain fresh stacks of MS. At five stacks, the OT will taunt Halfus off of the main-tank and the MT will taunt the two dragon targets (It can be too messy to pick up whelps, but for a short time the OT can handle Halfus and the whelps). At this point, another exchange is performed when the MT’s five stack drops off naturally (after thirty seconds). If you have access to any other spec of paladin, they can use Blessing of Protection (quickly followed by Blessing of Freedom) to ‘cleanse’ a stack of debuffs from a non-paladin tank, thereby easing the difficulty of one of these exchanges. The “quickly” part here is important; every paladin healer knows what happens when you just BoP the tank! Learning how to handle the tank swapping is a major obstacle in the fight. The other factor here is Shadow Nova. Our raid is geared enough now that we can afford to leave one melee DPS on Halfus throughout the entire fight (and this is what we do). Their sole responsibility (in addition to damaging Halfus) is to interrupt Shadow Novas. In the absence of the raid DPS necessary to accomplish this, tanks can now more easily interrupt Shadow Nova, but beware of Shadow Novas going off during a tank swap. It’s extremely helpful if ranged DPS in particular focus Halfus and be prepared to back-up Shadow Nova interrupts during the first few minutes of the fight. The damage from these is punishing, and can wipe your raid if even one goes off (considering the other AoE and heavy tank damage going out). Your task in this encounter is actually fairly straightforward: kill the first and second dragons and whelps before they can kill your tank. Initial aggro here is going to be shaky – we’ve had some clumsy wipes from pulling aggro on Halfus himself before we really figured out the encounter. DPS on Halfus hardly matters, especially initially. Don’t even attack Halfus right away. Give your tanks time to position all of the drakes. Your first target is going to be Stormrider. Depending on your class, you may also be responsible for releasing one of the drakes (I always release Nether Scion and blink, as noted. Our rogue usually releases the whelps and then uses Tricks to direct them towards the OT). If you’re a hunter, misdirecting Nether Scion to the OT is incredibly helpful. Once the tank has aggro on Storm Rider, we use Heroism/Bloodlust. Classes with the ability to do incidental (cleave, DoT) AoE damage to whelps and other drakes are invaluable here. 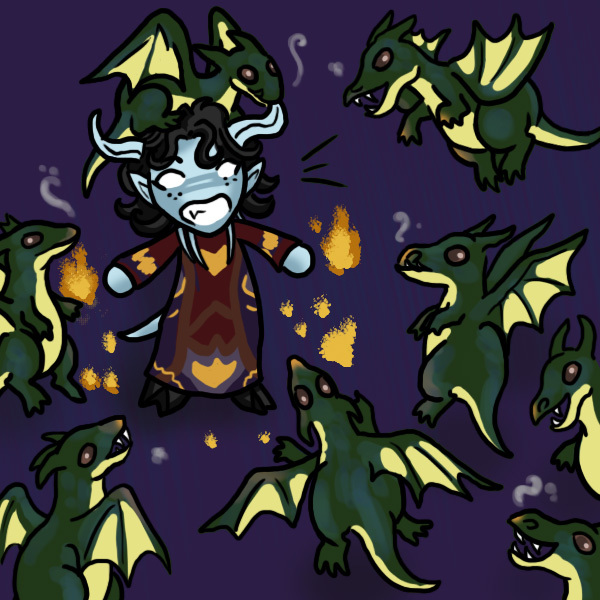 As a fire mage, it is no DPS loss to use Impact to spread your DoTs to the whelps – in fact, it will help you to do ridiculous DPS (upwards of 50K). The reason for this is also because of the way the damage debuff stacks on Halfus, you can attack Halfus and chain your DoTs to other dragons to do 100 (200, 300%) more damage as the fight goes on. I’m not going to speak to every class’s abilities, here – I know our rogue does very high AoE in this encounter, as does our hunter. One thing to note though is if you are using a method that allows for direct damage on Halfus and splash damage on the dragons, be careful. His health drops very quickly; and if you mistakenly push him below 50% while your group is still handling drakes and whelps, you will very likely wipe. I usually swap around targets after the first drake is down to make sure to not push Halfus too far while still gaining some benefit from his debuff. This will interrupt your Focus target if you hold down Alt as you press whatever key it’s bound to. Replace “Counterspell” with your interrupt of choice. Another option is to just assign one healer to a specific tank. I conferred with one of our guild healers for this section of the guide, and he wanted me to mention that a four-healer strategy is highly recommended and will help with the significant raid damage going out until Time Warden is released. You will, of course, need to have the DPS to compensate for the loss of one healer, and if you have the option of something like an Atonement priest, by all means use it. They do DPS and healing. Also, as a healer, use any mana regen abilities early on. You will get a brief reprieve (before Halfus hits 50%, and after drakes have been dying) and you won’t need much mana until phase two at that point. Paladin healers should save their personal bubble for phase 2; much like a mage’s Blink it can be used to escape Furious Roar and begin healing immediately. 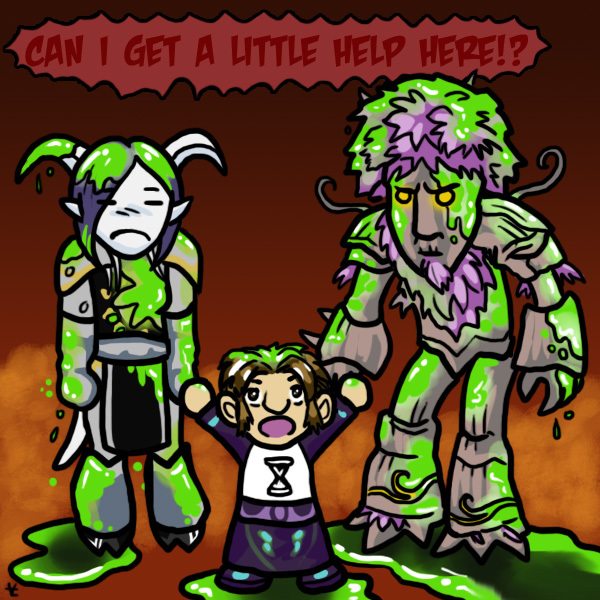 Our paladin, Sinpree, describes H Halfus as a pretty basic fight from a healing perspective. The biggest thing is maximizing mana regen at the beginning and making sure you put out the HPS to keep everyone alive, and then leaving yourself enough mana to finish the fight. Heroic Halfus can seem like a very complicated fight with so many things happening. You will probably wipe most while your tanks and healers sort out the initial damage and taunting mechanics. Above everything, keep your cool and remember that if you can survive the first portion you are well on your way to defeating the fight. Apart from interrupting Shadow Nova in P2, it’s all downhill after the first few drakes have died! Good luck, and if you have any questions feel free to ask them in comments. Here’s to more dead internet dragons!